Kody's Kids, Inc. * We inspire kids to grow up smarter, healthier and kinder. Inspiring kids to be healthier, smarter and kinder. Kody’s Kids was created to inspire preschool and elementary kids from all communities and circumstances to read and to enhance their lives by learning healthy habits and kindness to others that will enrich and make a positive difference in their school years. Each outreach program is designed to help kids reach their highest potential and to give comfort to those experiencing illness. Kody’s Kids is named after the organization’s official Ambassador, Kody O’Bear. 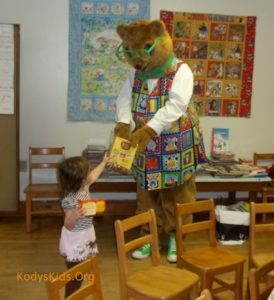 Kody O’Bear is a 6-foot animated and talking teddy bear who inspires kids to learn and be the best they can. This is done by teaming up with volunteer teachers in our Early Learning Program and the Reading with Kody O’Bear Video-Disc packet, Kody O’Bear’s YouTube channel, and other media productions. Kody O’Bear has been referred to as a role model, mentor, hero, and by one young student, “My reading hero”. Since our beginning in 2001, we’ve helped thousands of kids and we are making a difference. Kody’s Kids is a 501(c)(3) non-profit organization and relies on donations to fulfill our mission. We appreciate your tax-deductible (as outlined by the IRS) contribution.